We’ve had a can of Campbell’s tomato soup sitting around the house for several months now. It was brought by a friend to my teenage daughter in Paris as an icon of life in the United States. She has never wanted to taste the soup since she treasures the object — which, by the way, she used in her final 9th grade art project (on Andy Warhol). I, too, enjoy seeing this reminder of girlhood lunches of hot tomato soup on a cold winter’s day. But that was yesteryear. These days I prefer a more sophisticated version of this classic soup. Fresh ripe tomatoes, lovingly simmered, retain a bit of interesting texture in this recipe. 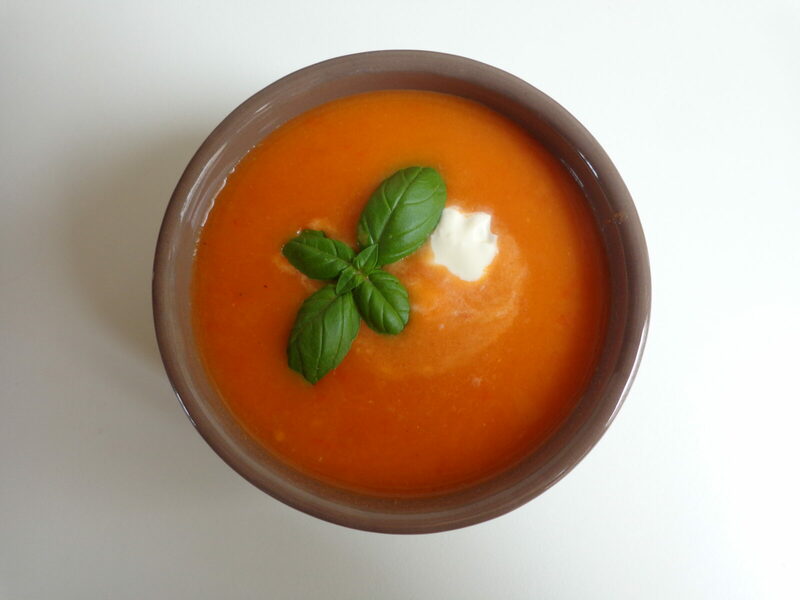 The flavor of the soup is intensified by a touch of balsamic vinegar and some fresh herbs. It makes a delightful start to a cool supper on a hot summer evening. Or you can serve it as the main course at lunch. As a bonus, it’s quick and easy to prepare, for a simple reason — you don’t need to peel the tomatoes. Enjoy the summer, and happy cooking! This entry was posted in 2. 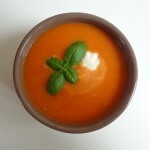 Soups and tagged recipe, soupe de tomates, tomato soup, vegan. Bookmark the permalink. Thank you for leaving me the great recipe. I will buy the tomatoes at the Maubert Market tomorrow, make the soup and raise a toast to your vacation. Bon Voyage! Have a wonderful adventure in California Meg. We look forward to some interesting tales and recipes.